Today’s closet is one which I consider a bit “over the top”. If I were Barbie sized I would not wear it myself. It’s not my style. However I do love the colours. The blue is like a summer’s day and the gold sets it off well although that gold skirt is a bit much I think. It’s not such a mix and match closet as some of the others but it is very glam. 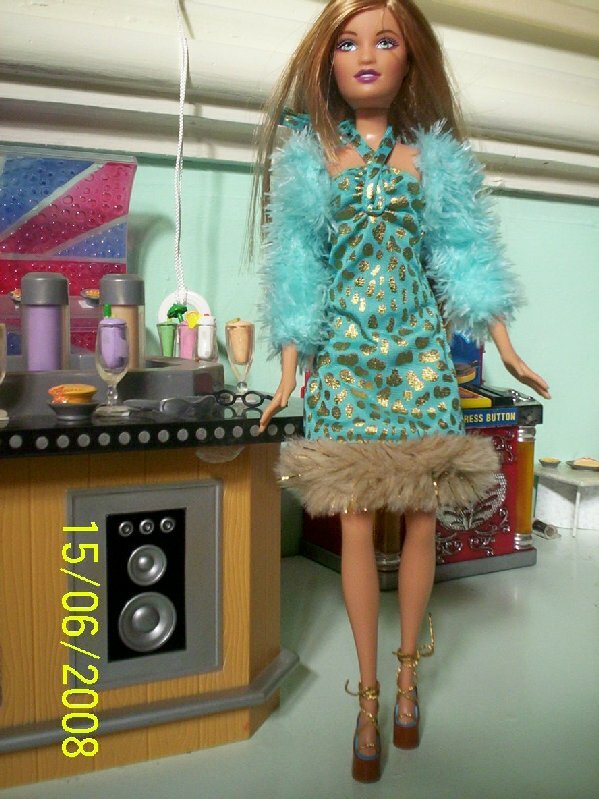 Today’s model is Pamela who is one of the later Fashion Fever Barbies with the redesigned body from 2006. 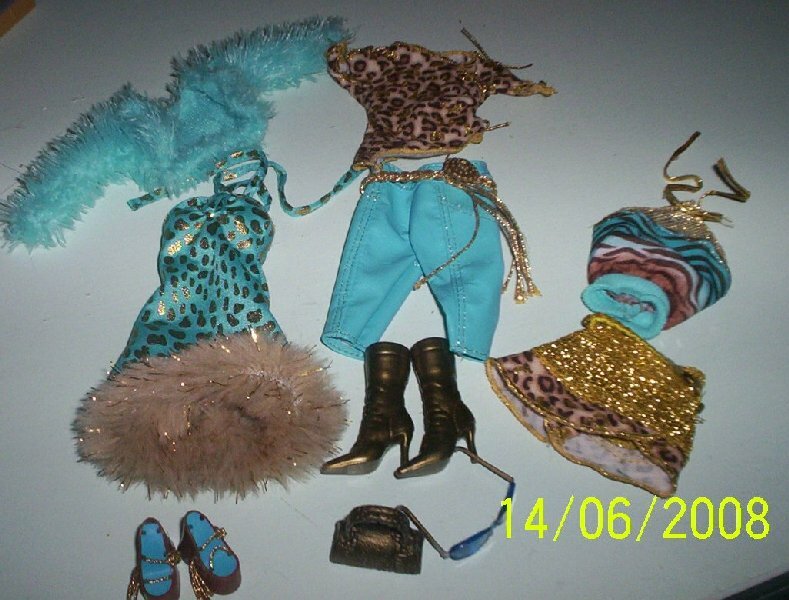 I think some collectors call them “Hobbit body Barbies” .Pamela is a Summer from 2007. 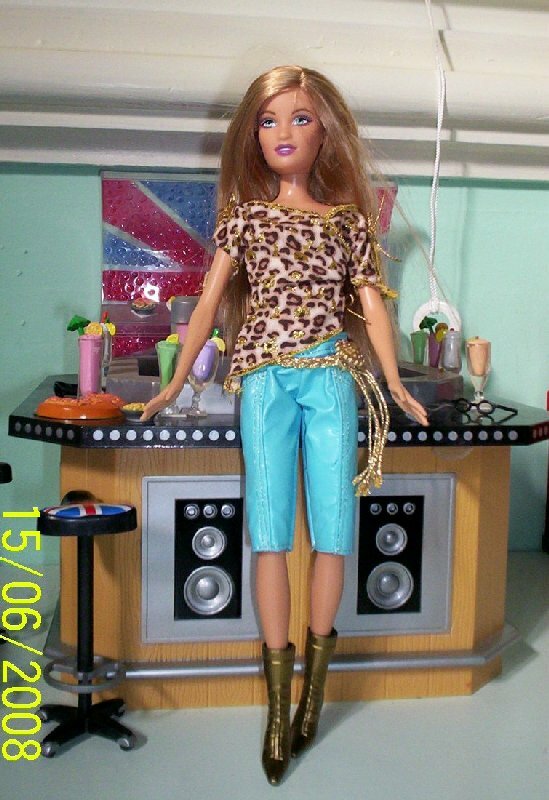 Pamela is a little shorter than the standard Barbie, she’s only 11″ tall. I don’t really mind that though as it looks more realistic to have Barbies in different shapes and sizes. It just makes dressing them a pain sometimes. I photographed this entire closet when I bought it and used Pamela for the model for all of it. I think she looks good in the outfits in this closet as they suit her colouring. Here she is in her original outfit. Pamela in leather look capris and print top. Pamela in the gold skirt and halter top. These sandals are cute but fiddly for a fumble-fingers like me. Pamela in the blue and gold print dress and the jacket. The bar background in these photos belongs to my sister. Her face has changed, too. I kind of like her. She looks more human. Yes, I prefer the ones with more natural faces myself. 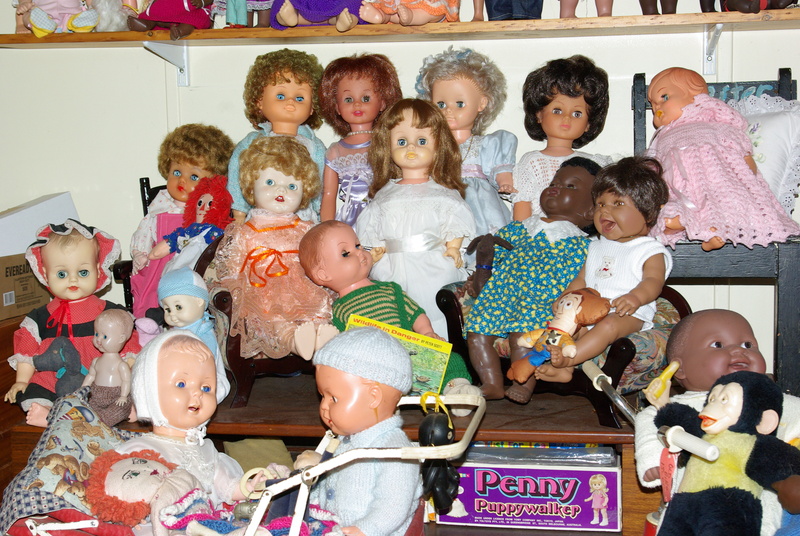 The original Barbie and a lot of the modern collectibles look very heavily made up and sophisticated. The eighties ones had big hair and big eyes which are cute but unnatural. The Fashion Fever dolls look more like people. She looks like a beta test for a grown up version of skipper, very sweet, I wonder if she can wear skippers knit fashions? Knits are a bit more forgiving so maybe. The “hobbit” Barbies have very wide hips so that might be an issue.